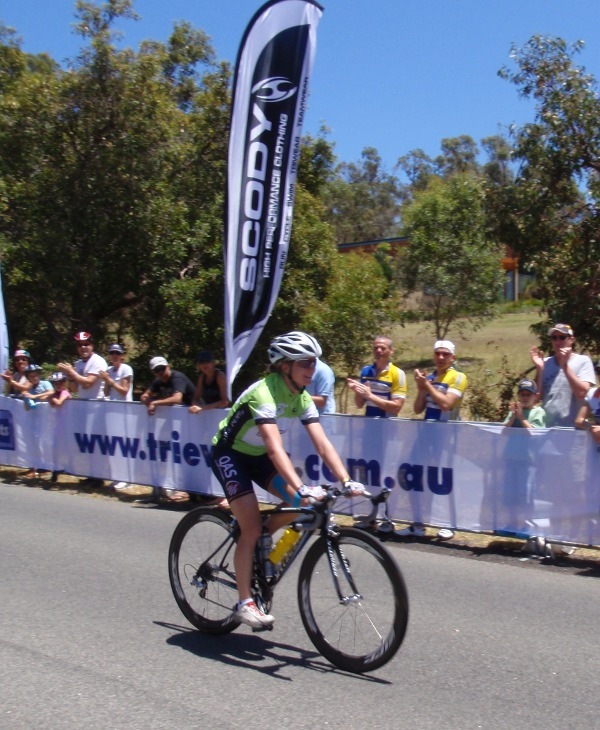 Following on from Saturday’s 1st stage of the Tour de Perth (not counting Friday night’s Northbridge crit) was Stage 2 & 3 held at Perry Lakes. This incorporated the PIHC Festival of cycling. 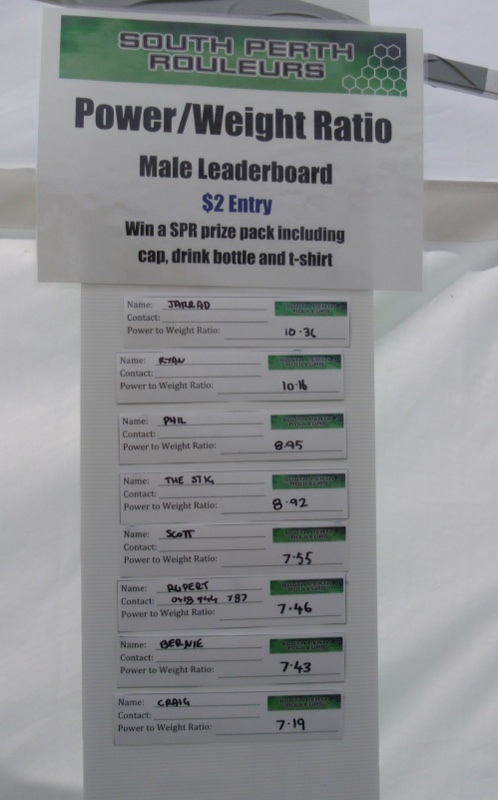 SPR had the team tent out for the day and showcased their wares as well as having a Power to Weight ratio challenge to see how riders stood against each other. Racing was pretty much a repeat of Saturday with the womens race and overall winner decided long before the finish line. 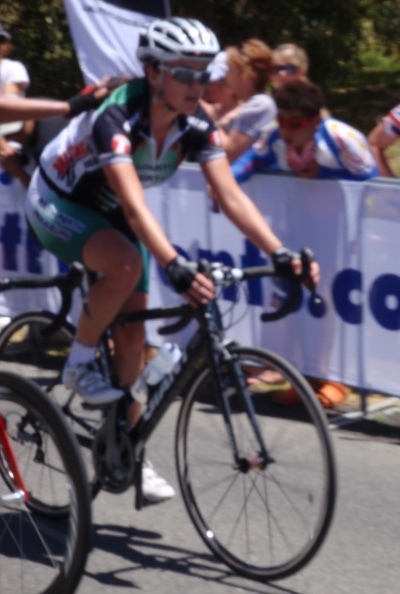 Ruth Corsett of QLD put in a smashing day yet again to dominate the field from the outset. Other placings were where the action was with a hard fought sprint finish and big efforts in the Individual Time Trial to be the deciders. The mens racing was a different story after a big sprint finish the Tour leader again changed, this time to stage 1 winner Robert Lang, but he was not to keep it and with a huge effort in the ITT, local rider Travis Meyer took the stage win and also the overall Tour victory. Friday’s critereum winner Graeme Brwon placed 2nd followed in 3rd by Robert Lang. Our SPR riders did well in the event with most finishing and putting in big efforts, unfortunately mechanicals and injury hampered the ‘dreams’ of a few. Next year we may have our own support vehicle (Nico). Matt Upton also did well in the fashion stakes giving everyone the 1st ever viewing of the SPR skin suit in action and a TV cameo during the start of stage 2. While Nicole Sloan managed the only photo (along with Sally Robbins) in a local paper (Sunday Times) for the weekend. So well done SPR. Meanwhile back at festival central Pete, Lorraine, Darryl and myself had the SPR tent rolling thru nicely. Lorraine was roping punters in with her ‘World Famous’ brownies, Darryl would then talk their ear off before Pete lured a few to the Power to Weight challenge, so I could pocket there gold coins into the SPR team ‘trust’. All in all a good showing for SPR at the event and some good publicity to raise the club profile. This entry was posted on 16 November, 2009 by Fairy. It was filed under Road Cycling and was tagged with Cycling, endurance, hot, Perry Lakes, perth, SPR, Time Trial, Tour de Perth.